While increased participation in physical activity is to be encouraged for the health benefits that it can provide, some people are putting themselves at an increased risk by failing to properly warm up or safely train. Although there are effective treatments for many sports injuries, and those who sustain sports injuries are often able to return to participation at some level, by taking the appropriate precautions, many sports injuries can be prevented. You can also help younger, active children with infant massage and baby massage. 1) What are ‘Sports Injuries’? ‘Sports injuries’ is a broad term that relates to the types of injuries that result from participation in sports or exercise. These injuries occur for a broad range of reasons, including: accidents, inadequate training practices, substandard or inappropriate equipment, an absence of conditioning and inadequate warm-ups and stretching. While sports injuries can affect almost any part of the body, injuries affecting the musculoskeletal system (including bones, muscles and tissues such as cartilage) are by far the most common. Physiotherapists commonly see and treat people who have sustained injuries to their musculoskeletal system and support them with physio exercises and soft tissue manipulation. Some sports injuries require first aid and the immediate attention of emergency personnel, while others can be treated by a qualified and skilled professional, such as a physiotherapist. Physios provide varied and extensive support including exercise rehabilitation and specific exercises to strengthen muscles and joints, so that your presenting injury is not only treated but future injuries are prevented. Beyond the immediate treatment to a sports injury (rest, ice, compression and elevation), there are a number of different ways that sports injuries can be treated. The purpose of rehabilitation (in the form of exercise), is to return the injured body part to its normal range and level of function. While a physio will provide specific exercises and recommendations, it is often the case that getting the body part moving as quickly as possible following an injury expedites its healing. Mobilisation commonly begins with a range of gentle exercises designed to increase range of motion. Then the treatment progresses to deeper stretching and strengthening exercises. As a person’s injury heals and scar tissue forms, the risk of re-injury is heightened by damaged tissues that are tight or stiff. In light of this, stretching and strengthening exercises are all the more important. 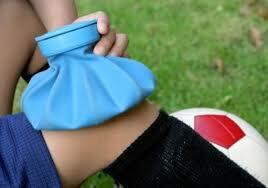 Another treatment for sports injuries is non-steroidal anti-inflammatory drugs. While inflammation is critical for healing, it can also hinder the healing process if it is not checked and managed. As a result, some doctors and health professionals advise patients to take such anti-inflammatory drugs as: aspirin, ibuprofen and naproxen sodium. No one anticipates sustaining a sports injury, but the reassuring news is that there are some effective treatments available through health professionals, such as physiotherapists. While treatment should always be sought for sports injuries, it is vitally important that individuals also commit to the prevention and re-occurrence of injuries.